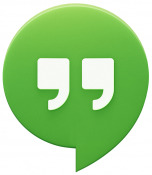 I would love to see someone take on the daunting task of creating a Google Hangouts app for Windows 8.1 and Windows Phone 8. But instead of focusing on making a Messenger app that can launch into a Hangout, like Google does, making an app which focuses on Hangout video calls and On-Air ones at that. More of an video events type app that pulls in all public Hangouts and Hangouts shared with you. But also having the ability to join or host Hangouts directly from within the app.